Documentation: Photograph: 28 Oct 1987-7 Mar 1988 Kearney, Buffalo Co (Paine 1988). Winter: Inca Dove has been reported eight times, all documented. All but one of the records are of birds which arrive in fall and attempt to overwinter at feeders. Juvenile Mourning Doves are sometimes mistaken for Inca Doves. Three were reported at Lincoln, Lancaster Co 31 May 2007 by an observer familiar with the species in Texas, but no photographs or details were provided. An additional report was of one well-described near Madison, Madison Co 15 Oct 2000; the observer conservatively questioned its origin, suggesting that it was brought from Arizona and released along with some other birds (William Flack, pers. comm.). Comments: A species of the southwest, like White-winged Dove it appears to be expanding its range northward on the Great Plains, albeit much more slowly. In Kansas it breeds rarely in the extreme southwest and is a “casual visitant statewide”; the first Kansas record was in 1951 (Thompson et al 2011). There is one record for South Dakota, Oct 1983 (Tallman et al 2002). 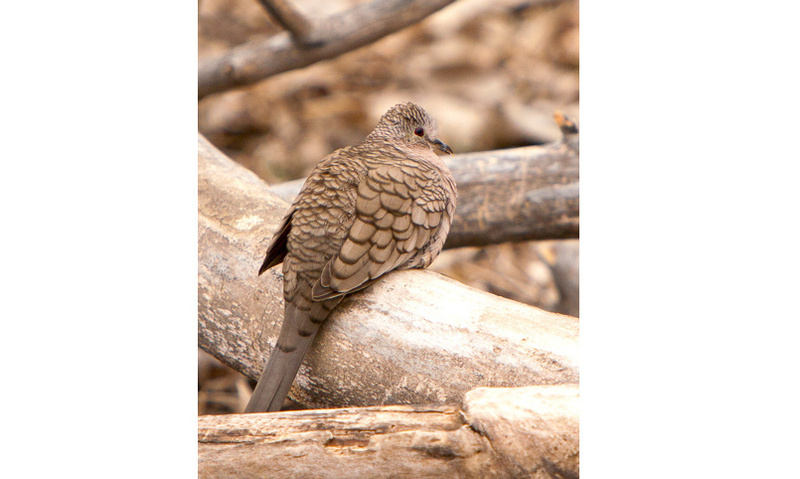 Photograph (top) of an Inca Dove at Bellevue, Sarpy Co 18 Mar 2006 by Paul Roisen. Paine, E. 1988. An Inca Dove in Nebraska, in winter! NBR 56: 3.